Hi friends! 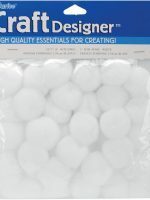 Today starts week 2 our our Bake Craft Sew Decorate series! 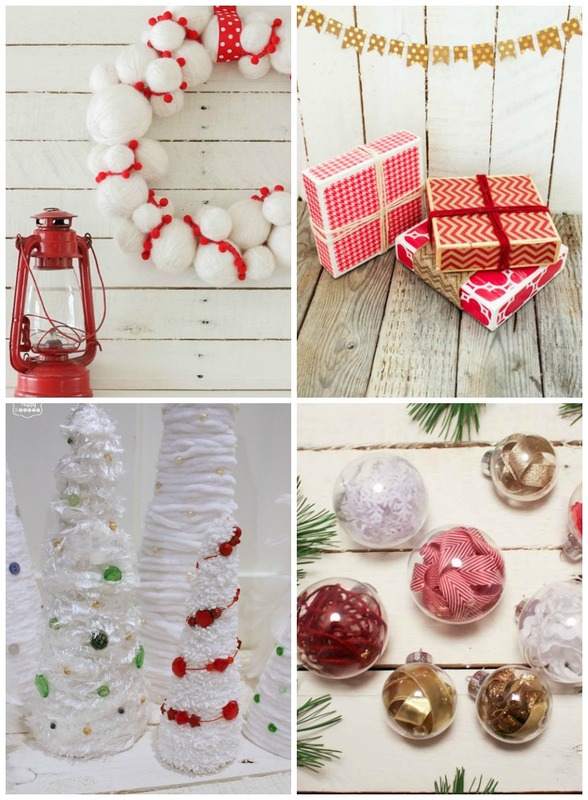 Catch all the Christmas and Holiday Decor Ideas you may have missed last week here. In case you’re new, this month we are teaming up with our blogging friends Cindy, Mique, and Leigh Anne! Cindy will be doing sewing ideas on SkiptomyLou, while Mique from Thirty Handmade Days, will be posting craft ideas, and Leigh Anne from Homebased Mom will be posting delicious edible gift recipes so follow along all month long! Hello friends! It is Krista here, from The Happy Housie. I’m super excited to be part of the Bake, Craft, Sew, Decorate series this year!! I am already in full-blown Christmas mode around here and I and plan to spend this month crafting, decorating, shopping, cleaning, organizing, and wrapping so that I can really enjoy my time with friends and family once December arrives. Since the holidays are such a busy time I love to do craft projects that are quick and easy. 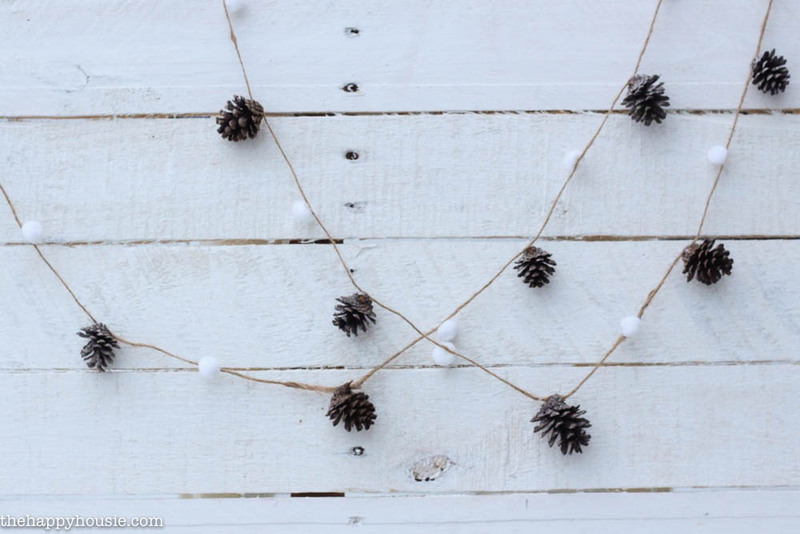 I also love adding rustic and natural elements around the holidays; whether it be real greenery from outdoors, or using pinecones and rustic twine in my crafts like I did with this simple DIY Pinecone & Pompom Garland. This was super easy to make and took me only a few minutes to create an 8′ long garland! 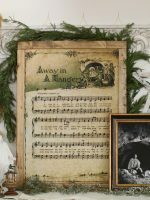 You could use this to decorate your mantel, a window frame, or even make several to wrap around your Christmas tree! 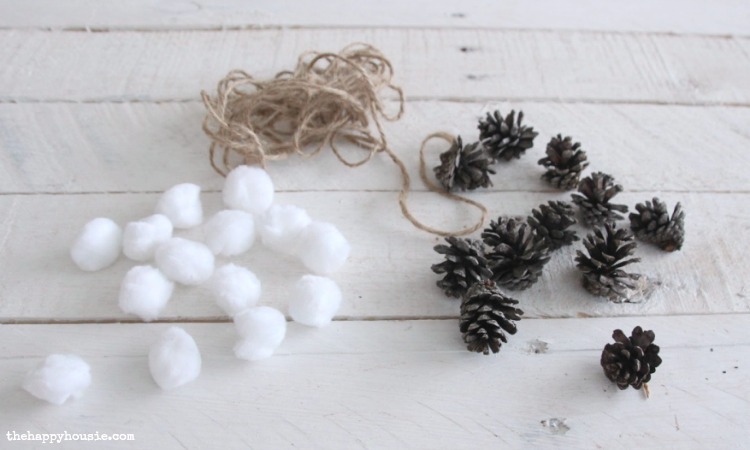 I simply gathered together some small pinecones that my boys and I collected on a walk in a nearby park, as well as some small white pompoms, rustic twine and my glue gun. Simply decide on your spacing – I put mine every 4″ along. 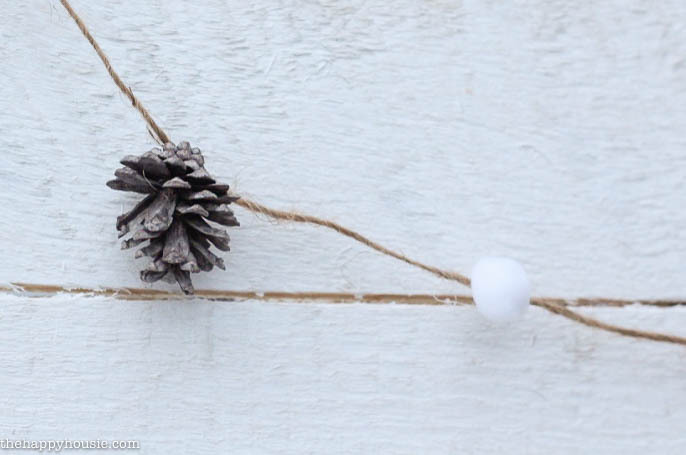 Stretch out your twine, and alternate gluing on a white pompom with a tiny pinecone. To help me keep the spacing consistent, I used a piece of paper the size that I wanted the gap to be as a measure between pompoms & pinecones as I glued them on. 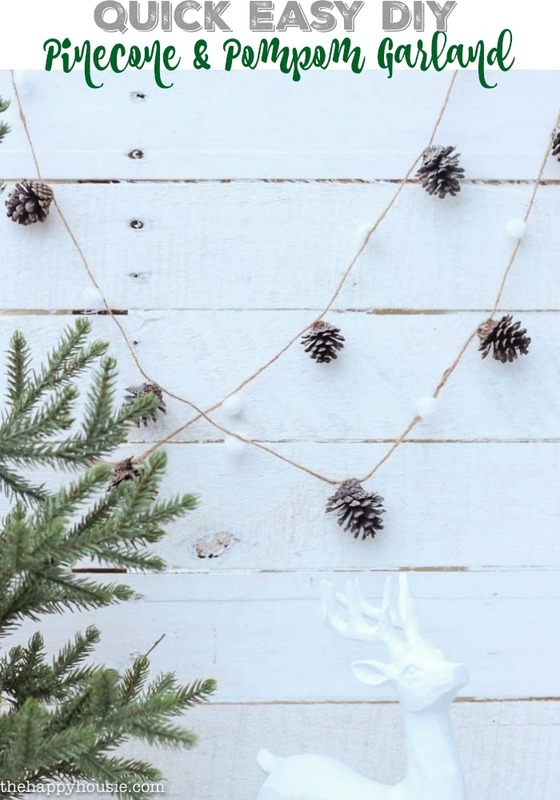 The fabulous thing about this cute little pompom and pinecone garland is that it can suit so many variations on Christmas and Winter decorating. You could use it from November right through February – from Thanksgiving right up until Spring arrives! Easy peasy! And you have tons of time left for holiday shopping, baking, cleaning, prepping for guests, wrapping… you get the idea! 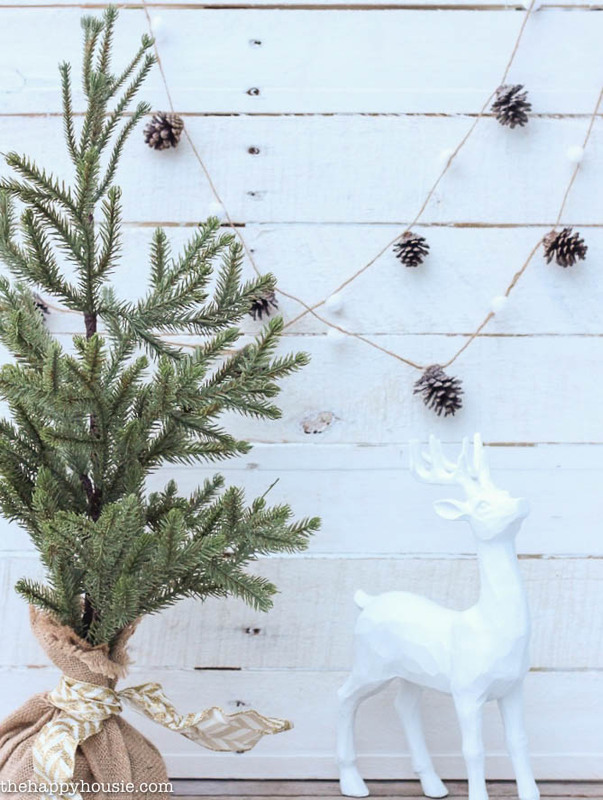 I’ve got lots of other quick and easy DIY Holiday decorating ideas if you want to pop by for a visit! Thanks so much for having me as part of this fun series, Mallory and Savannah! Thanks so much for sharing Krista! Be sure to follow Krista on her blog, The Happy Housie and Facebook, Instagram and Pinterest! Thanks for having me over as part of this fun series, ladies!! I’m so neck-deep in Christmas ideas now and it’s so fun to start sharing them!! 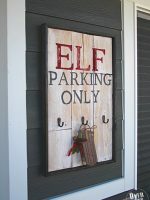 These are the cutest garland I have seen for the holidays! 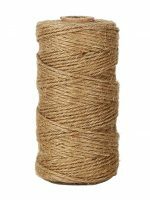 They are just adorable, and can be used for so many things like decorating the tree, or just decorating the house for the season!